Tripp Lite's DRS-1215 offers surge and noise suppression in a versatile all-metal multi-mount cabinet. Detachable mounting flanges are configurable for rackmount, wallmount and under-counter installation. Uses only 1 rack space (1U) when installed in any 19 inch EIA standard rack. 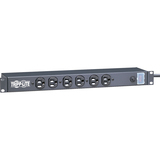 Includes 14 outlets (6 front/8 rear), 15 ft AC power cord and guarded power switch to reduce the risk of accidental shutoff. Diagnostic LED indicates surge protection status.